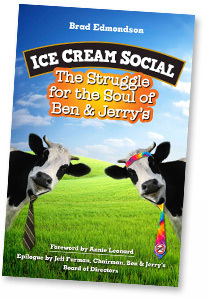 The Sale Agreements between Ben & Jerry’s and Unilever are at the heart of Ice Cream Social. They are legal documents that Ben Cohen and other board members negotiated with Richard Goldstein and his team at Unilever before the company was sold. The Agreements establish Ben & Jerry’s as an independent corporation that has only one shareholder. The shareholder (Unilever) grants certain rights to the company, including the right to maintain an independent board of directors that has the power to enforce the Agreements. It also gives this board the right to name its own members with no interference from the shareholder, in perpetuity. That means forever. There’s a lot more detail in Chapter 10. The Agreements are public documents because the shareholders of Ben & Jerry’s had to approve them before they could vote to sell their shares to Unilever on August 3, 2000. They are posted on the website of the federal Securities and Exchange Commission. Here is the easiest way to find them. First, go to the SEC site at www.sec.gov. Then click on the button that says “Search EDGAR.” The Electronic Data Gathering, Analysis, and Retrieval system is how the SEC organizes and publishes the bazillions of legal documents in its files. In the box labeled “Fast Search” on the EDGAR Home page, enter the Central Index Key (CIK) number for Ben & Jerry’s Homemade, Inc.: 000768384. Bingo! These are documents that Ben & Jerry’s Homemade Inc. released to its shareholders when it was a publicly traded company, going back to April 19, 1995. The Sale Agreements are contained in documents dated April 13, 2000 (two days after the board agreed to sell) to August 3 (the day the company’s shareholders agreed to Unilever’s offer). Many of these documents are primary material I used when writing Ice Cream Social. Unless you’re a lawyer with a lot of time on your hands (or even if you are) I would strongly recommend that you buy the book and read it before you start digging.